This little girl is all shades of adorable. She takes on a lovely violet tone, with the undersides of her body fading for a sort of lavender to a pretty fuchsia. She'll never grow to be very big, but she doesn't seem to mind in the slightest! Her squeaks are rather high pitched and mostly out of distress than anything, and in general this gal's pretty calm. She'd rather plop down and take a spot on your arm or shoulder any day than zoom around. She also seems to tend to prefer to stick onto the skin of a woman over a man, probably because females have softer skin or something like that. She's most comfortable around her bond however, and will be rather shy around any others. She isn't very good around big shinies, either. Squeak! This one never lets go. Her favorite thing in the entire Weyrd is sticking to faces, and there are just so many faces around to stick to! She's extremely friendly, and not a bit shy about introducing herself to someone's cheek and squeaking away happily for the next few hours. No amount of prying and pulling will ever get her to release her sticky little arms, and in fact the attempts just seem to encourage her to want to stick around even longer. The trick is to give her just a little tickle in the center of her body, which will cause her to squeal happily and curl her arms up, breaking the vice-like suction that keeps her stuck to someone. She tends to leave little red marks on those she chooses to cling to, but who could be mad at such a cute little Brightling? 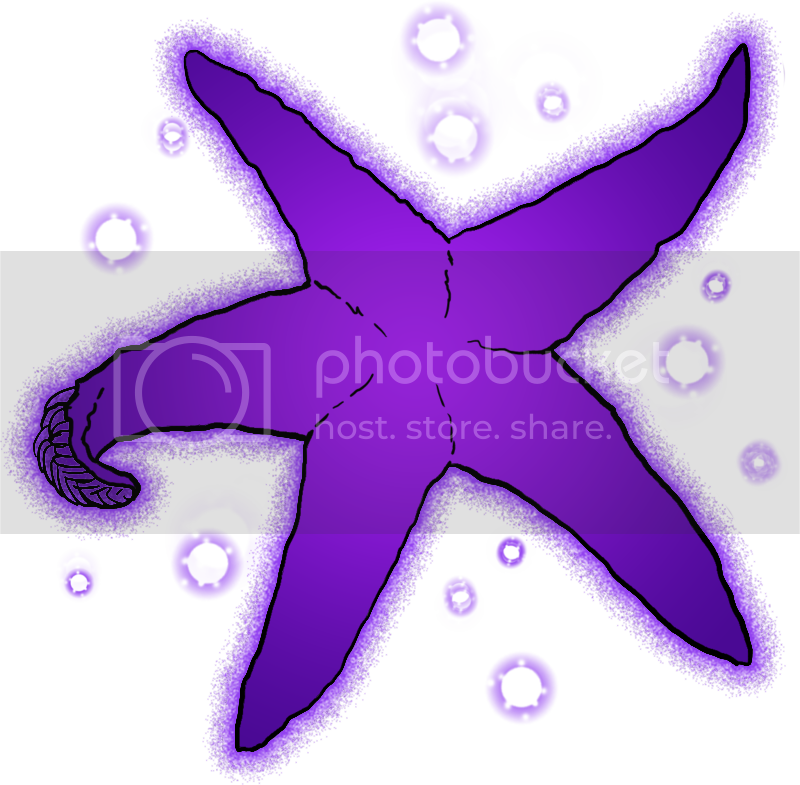 Her round body is a pleasant purple color, with her short little arms a darker shade of indigo. Don't be surprised if you lose track of this male once in a while. Sea life though they might be, this particular Brightling is just at home on land, and blends in as well, with a velvety skin of bright spring green and fresh yellow-green. He has long, thin, and nimble arms sprouting form his center, and he puts them to use being a happy little helper. Want him to fetch something you left in the yard? Pull weeds from the garden? Fold the bedsheets? He's on it! Well, if you actually do want him to fold your bedsheets from the clothesline it might take a little while because he still just one little Brightling, but he'll do it! Set him to task and he'll cheerfully whoot and comply. He's been granted such great dexterity, should put to use what you've been given, right? Zzzzerp. Can Brightlings be sinister? There's definitely something a little unsettling about this murky male. He has a habit of hiding in shadows and stalking anyone who comes within range. He'll follow for a while, and then he'll slip back into darkness with a soft hissing zerp to await the next passerby. It's unknown why—or for whom—he's collecting information, and though he usually knows where any one familiar shiny or person is at any given time…good luck getting that information out of him. He probably wouldn't communicate it even if he could, but perhaps that's for the best, as he'd be a considerably more dangerous shiny if he wasn't merely the size of a palm. He sure can clear out a shrimp buffet, though… This roughly-textured male's body is a murky dark green and the undersides of his long, sinewy arms are even darker still. At the base of one arm is a spot of gold, visible in the shadows like a watching eye. This guy's a little bit nervous wherever he is. He's always afraid of messing things up, always afraid to make a fool of himself, but is too afraid to be left alone to abandon the popular crowd to do what he likes. He's a touch larger than your average male, with a charcoal grey body and a thin pair of lines, one cyan and one bright red, that reaches down each one of his legs. His underside is a sort of dull shade of white. Whether he is in a crowded room or in the quiet, he's always trying to please those around him. He'll try to blend in with his situation, try to be another cool guy that can both show and have a good time. But honestly, he isn't the most extroverted fellow. In fact he'd much rather spend his time in peace with T'Rae by his side. And any shinies or humanoids that are energetic and more aggressive only make him want to close away and hide. Because he can't match that energy, he can't match their strength. But he'll sure as hell try, try because even if it doesn't necessarily make him happy, it at least might make his bonded happy. And that's what he really wants, even above the peace and quiet.